There is nothing more interesting than mushrooms. Really. An independent kingdom of organisms, they have much in common with animals and their interactions with plants are complex and often beneficial. For a wonderful read about mushrooms and their biological role, check out Paul Stamets’s Mycelium Running, and you will be wonderstruck at the hypheal hijinks going on all around you. They are extremely easy to grow for everyone but me. 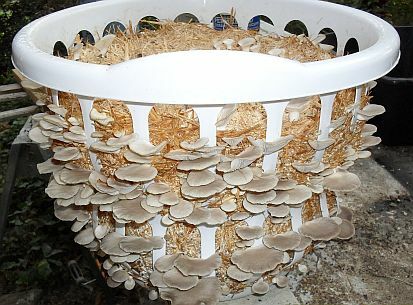 I am convinced that mushrooms have a very important role to play in a functioning urban homestead, even here in the high desert. So far, however, I have been unable to make that work out in practice. 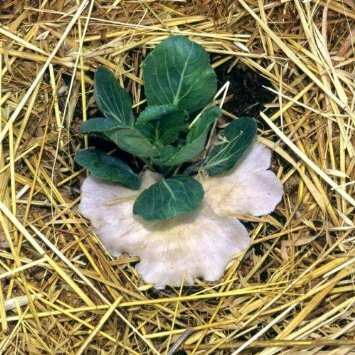 I have tried spreading the spawn among existing plantings under heavy straw mulches, and putting the spawn in piles of hard wood chips, and so far have not had any significant success, due to lack of consistent moisture, lack of shade, dry air, and insufficient attention. I have harvested a few mushrooms, but nothing to write home about. That is why the below images below are borrowed, to show how easily it can be done in moister climates than mine. Since I have finally accepted that it’s going to take more focus than just throwing some spawn around, my next attempt will be to insert plug spawn into damp hay bales in the dense shade of my black locust tree. I have also cut down a small Siberian elm recently and have a few pieces of suitable fresh log to try drilling plug spawn into. Next August I will harvest them, or not. 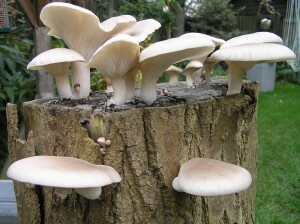 Meanwhile, many farmers’ markets have a mushroom farmer or two, and oysters can be found in our river bosque here and in many woods and forests if you are a knowledgable forager and know exactly what you are picking. 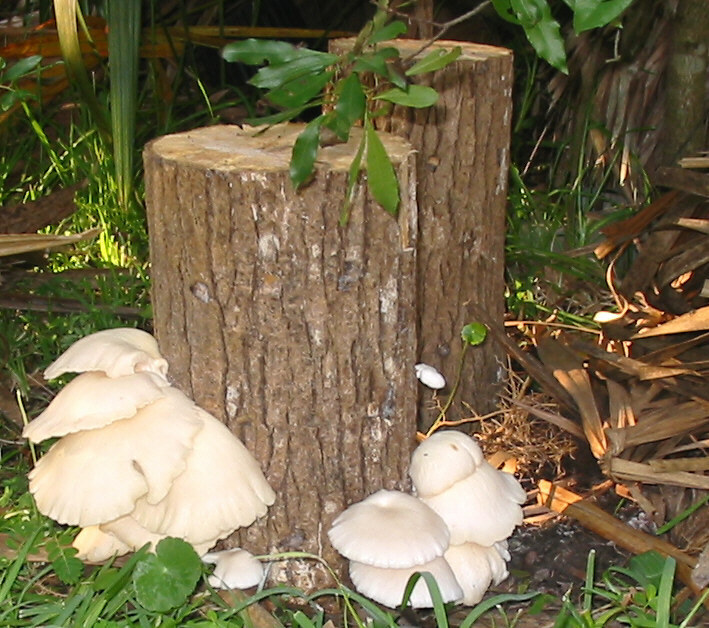 Mushroom foraging is not for you unless you are prepared to study it seriously and know all your local toxics. No margin for error here. However you get hold of them, good oyster mushrooms are just delicious. I love their earthy-almondy aroma and their meaty texture. I like them best simply pan-fried with a little macadamia oil and salt, but roasting them with a bit of butter and soy is awfully good, and so is grilling them rubbed with olive oil. 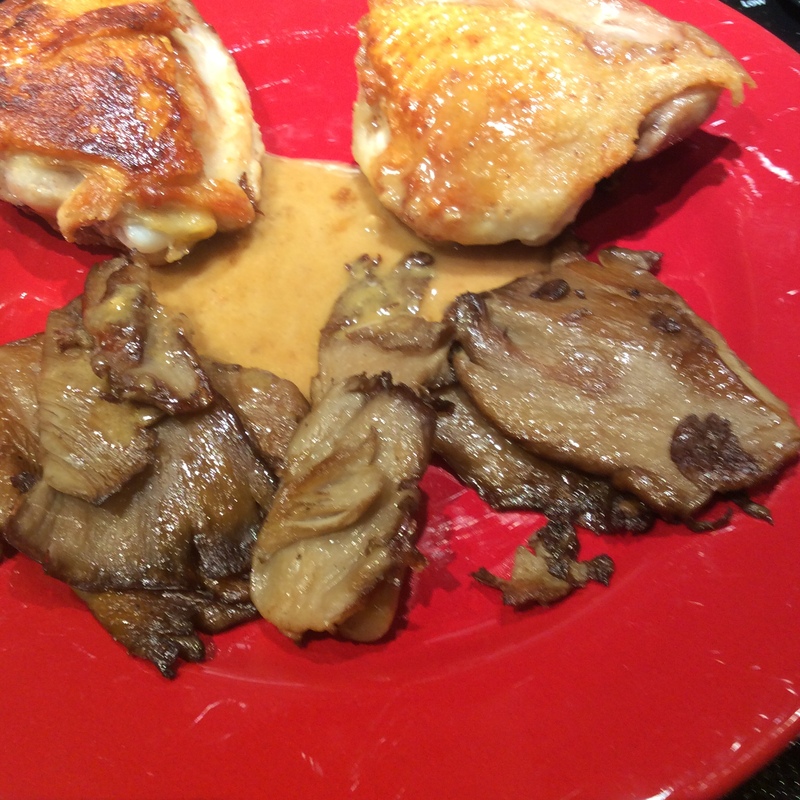 The addition of a little chicken glacé early in the cooking stage so that it can cook into the caps suits their meaty flavor. For preserving, I roast them with macadamia oil and salt just to the point that they are cooked through, cool them, bag, and freeze. When wanted, they can be thawed and pan-grilled until they get some lovely brown crunchy bits. I dehydrate the clean stems as long as they’re not buggy and grind them into oyster flour to thicken mushroom sauces and soups. I admit that I also open my little bag of oyster flour just to inhale deeply and recall the woods where I found them. Some cookbooks make you cook. The recipes are smart and well-crafted and will clearly work, and you want to run to the kitchen and get started. Other cookbooks make you think. They are provocative and, at their best, subversive, and expand your possibilities even if you never cook a single recipe. Today we have a thinking cookbook. When I first looked at this book a few weeks ago it seemed meant to be weird. In fact, it seemed at first to have a self-consciously outré quality that set my teeth on edge. An example: “lemonade” made, not with citrus, but with 2000 lemon ants, a citrusy-tasting ant found in Southern California, crushed and macerated. Surely juicing a lemon would be quicker and better, although the image of some earnest chef-wannabe counting out 2000 lemon ants is an interesting one that will be with me for a while. The author proposes that some fermentations to make vinegar need to get started from the fruit flies that they naturally attract because the little bugs carry something (Acetobacter presumably) that start the conversion to vinegar. Yech. As I see it, fruit flies are why humans invented cheesecloth, and nothing will convince me that they are better fermented than slurped straight-up just as they land in your wineglass, an ingestion that I avoid if at all possible. 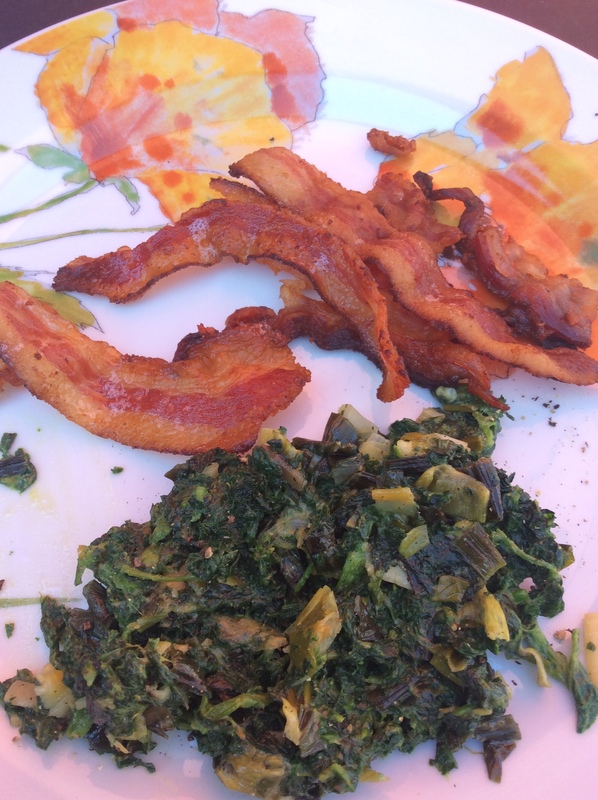 There are a series of recipes with “forest floor” seasonings composed of grass and leaves found under trees, and I can’t say that I have ever nibbled on a grass that I would consider potentially useful as a seasoning. There are a lot of recipes for lacto-ferments, and having lived through the last lacto-fermenting craze, I am not very enthusiastic about having another one. Lacto-fermented elderflower “beer” might sound elegant but is nowhere near as good as a well-made wine. The current obsession with local terroir in wine often involves mediocre grapes, inferior bottling practices, and determination to drink bad wine because it somehow tastes of the locale, and I thought that author/forager Baudar’s “primitive brews” would be much like that. In short, I thought that I would pan this book and get on with other things. Instead, after owning it for a few weeks, I keep going back to it and thinking, and gradually realizing how wrong my first impression was. I have seldom encountered a book that makes me think as creatively about possibilities, and this is after reading, foraging, and cooking for decades. Now the lemon-ant lemonade seems, not tricksy and silly and literally intended, but an invitation to explore the possibilities around you in ways that you might never have thought of on your own. In effect, the recipe tells you “Don’t limit yourself. Think about every possibility.” Bauder’s practice of letting his gaze light on something familiar and spending some time thinking about its culinary possibilities is infecting me with new pleasures and possibilities. 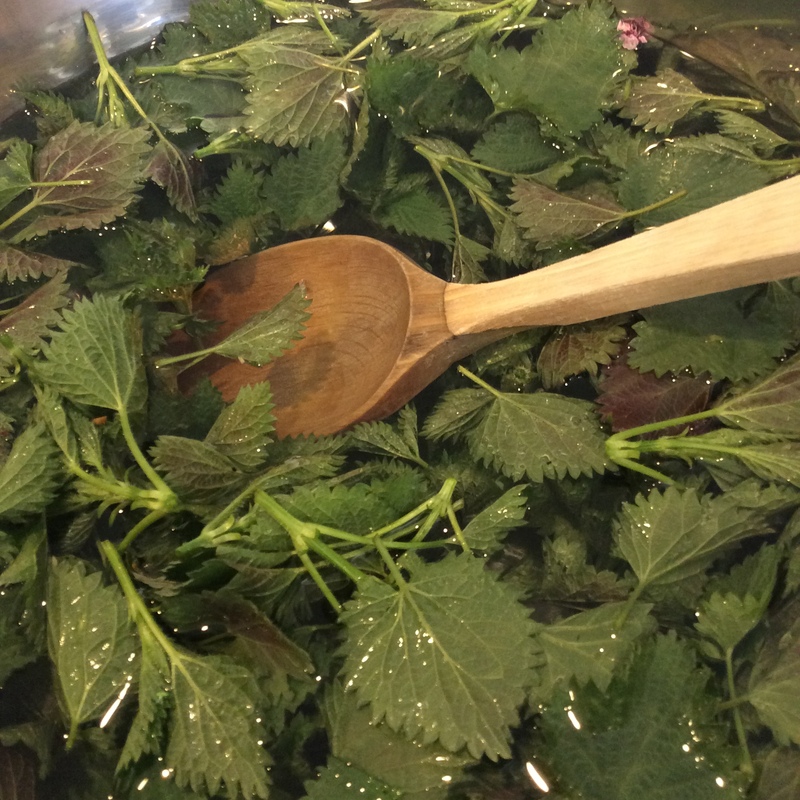 Make wild greens kimchee out of whatever greens suit your fancy, and not only enjoy it as is but dehydrate it to use as a seasoning? Sure. Try cold-infusing the deliciously honey-scented goumi blossoms in my front yard to make a drink, as Baudar does with elder flowers and others? Not until my bushes get bigger, but then I will. Put a few of their blossoms on salads now? Of course. 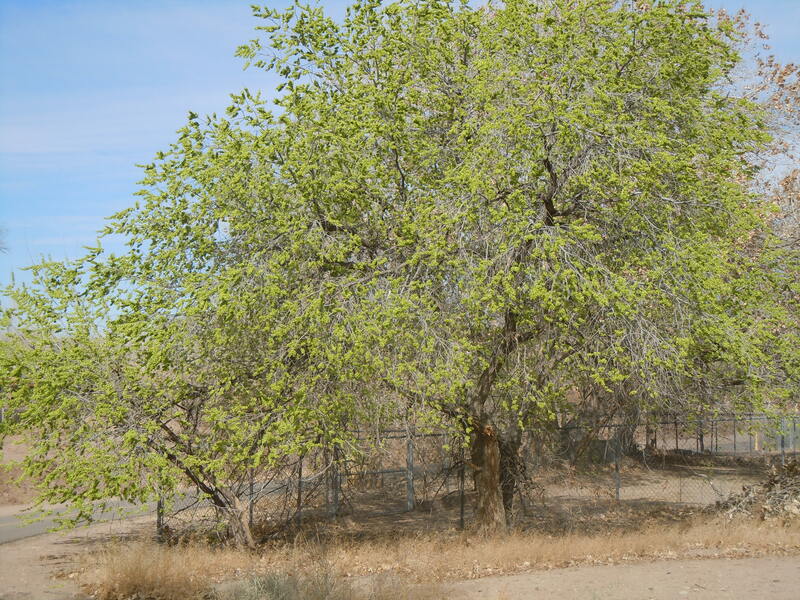 The trash Siberian elms that invade the Rio Grande bosque; have I ever thought about whether their scented cambium (inner bark) had any flavoring possibilities if roasted or smoked and infused? Not until I read this book. I like to make verjus from unripe grapes in the summer and enjoy its clean sourness anywhere that I might use lemon juice, but I’ve never thought of juicing other unripe fruits for the same purpose, and I’ll enjoy testing their range of flavors. I may well try roasting outdoors on a hot stone, or cooking something fast and delicate by arranging pine needles and herbs over the food in question and burning them. It has been a decade since I made flavored vinegars for shrubs, but now I will because this book has excited me all over again about the possibilities. And yes, I will certainly be trying “primitive brews” akin to his and experimenting with my local versions of his SoBeers, fizzy low-alcohol concoctions somewhere in between soda and beer. I’ll be tasting my own local grasses and herbs again to test their flavoring possibilities. I’ll be making vinegar-based and fermented hot sauces. I’ll try vinegars flavored with an assortment of my local seeds to grind into a mustard-like condiment. In short, I will view the familiar things around me, with uses that I think I already know, with new excitement and find new uses for them. Once over my initial dubiousness, I began to think that this is one of the most exciting cookbooks that I have read in a very long time. See where it leads you. Odds are that I will never cook a single recipe from it as written, because that isn’t the point. 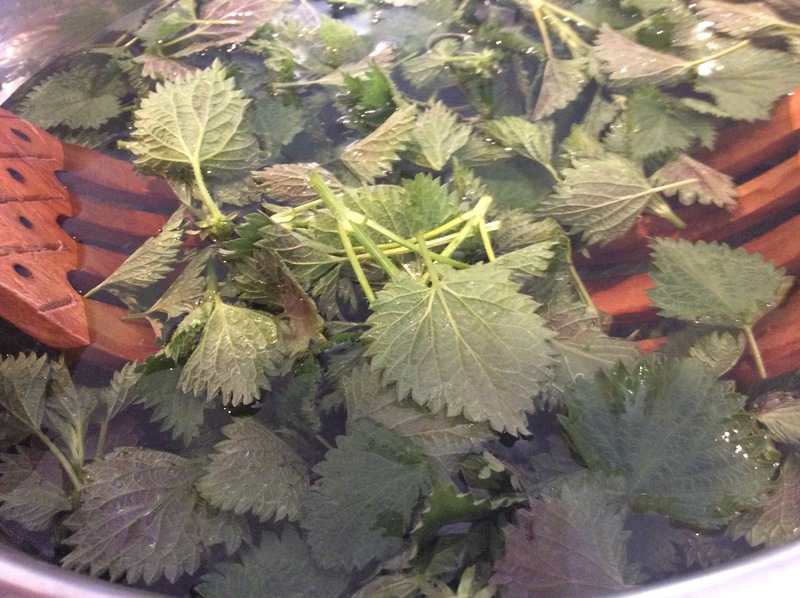 I trust that it goes without saying (but here it is anyway): YOUR SAFETY IS YOUR RESPONSIBILITY when foraging. Study, consult guidebooks, and know for certain what you are about to taste. This book is not a guidebook and will not teach you the safety of your own local plants and animals. Don’t wander around tasting things at random, like a feckless innocent in Not-Eden. That kind of thing gives foraging a bad name. There are some plants for which I have an intense and personal dislike, and the Siberian elm is close to the top of the list. It’s one of our more common trees, because it’s so highly adapted to invade and crowd out more desirable trees. The seeds come up everywhere, and their hold on life is astoundingly tenacious. Even as tiny seedlings, they have a deep root system. If you don’t get the whole thing out, they will come up from the root, they spread by root, and they produce, by scientific measure, a trillion skillion seeds per tree per season. But this time of year, they have two good qualities. 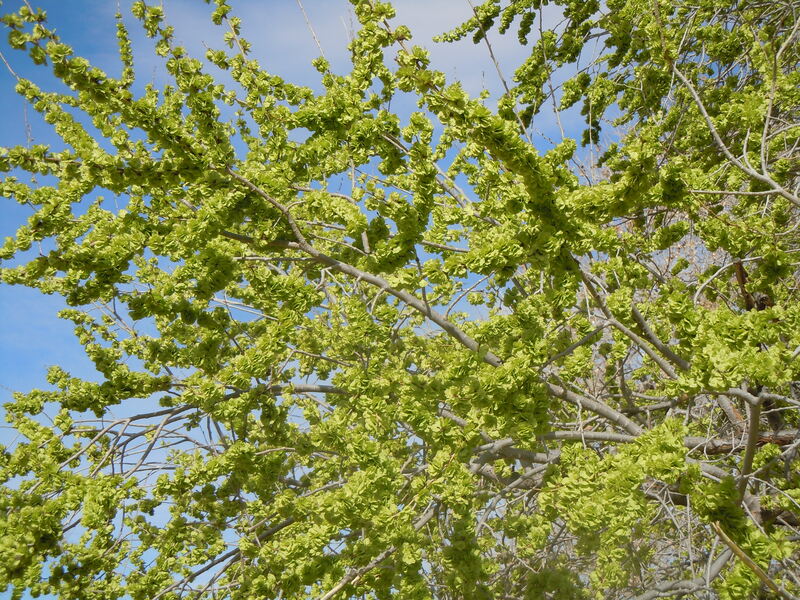 The first is that they cover their branches early in spring with bright lime green samaras, the casing within which the seed develops. They look fresh and green before anything else, which lifts my spirits toward spring. And, the samaras are edible and quite good, and available in mind-bending quantities. The samaras are round and paper-thin. Just pull them off the branches by the handful and add to salads or eat on the spot for a quick snack. Be sure to get them young, when fully expanded and a little over half an inch across but before the edges have started to dry and lose their intense greenness. Taste a few. If there is a “papery” feeling in your mouth, they’re too old. Use only those that are tender. 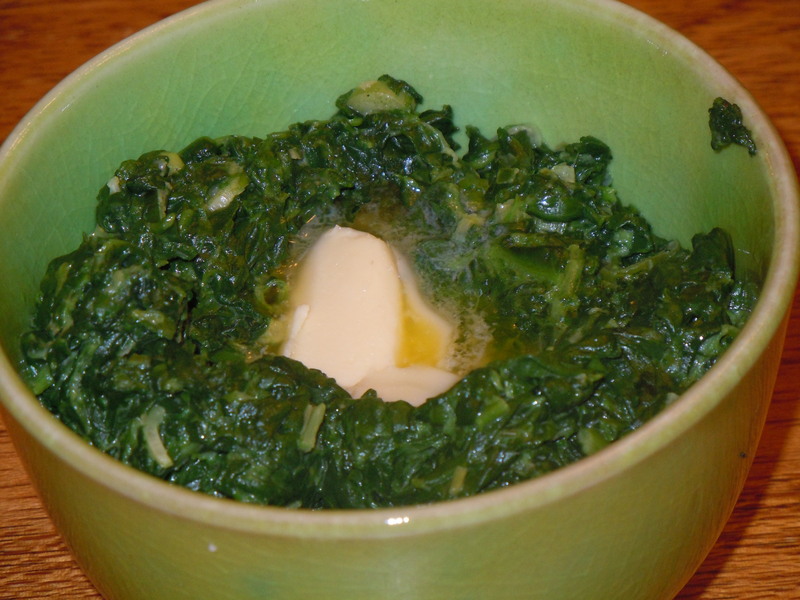 The flavor is pleasant, mild, a little “green,” and very slightly sweet. They don’t have the texture or character to endure cooking. Just eat all you can, and if you have chickens, goats, etc., give them some too. There’s plenty. Whenever you eat a food that is completely new to you, use good sense. Eat a little, wait a day, eat a little more only if you had no reaction to the first try. It goes without saying that you don’t put any wild plant in your mouth unless you are 100% sure what it is. 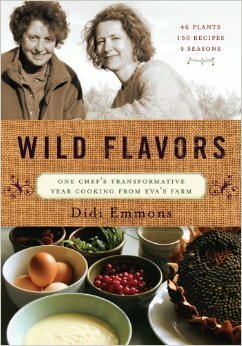 For more on wild foods and foraging common sense, read anything by Samuel Thayer or John Kallas. 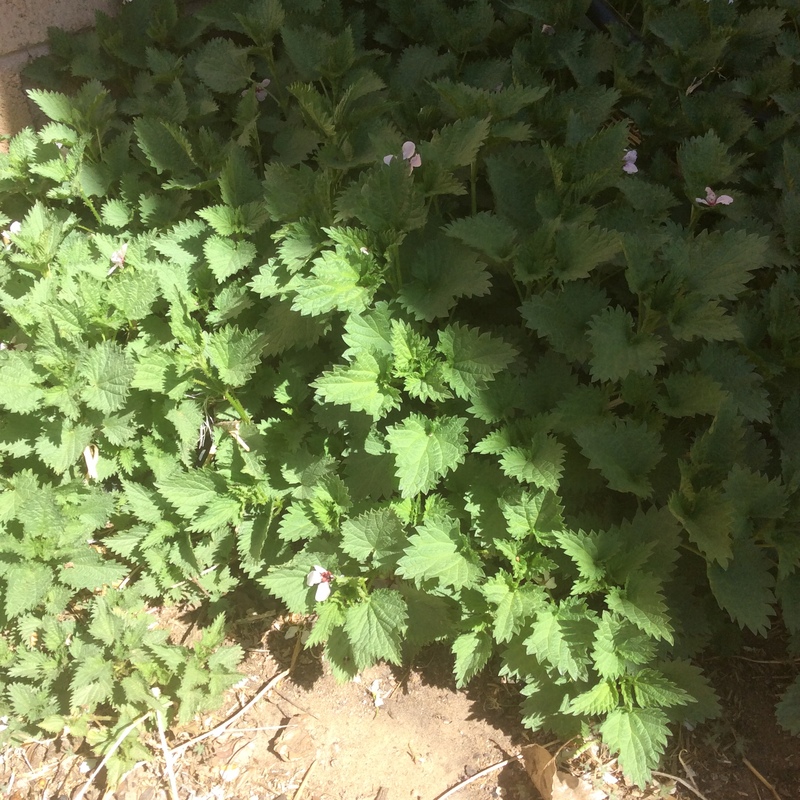 Please don’t use my blog to identify plants, since identification is not my emphasis. You need a couple of good field guides for that. 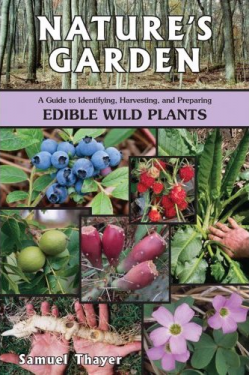 Start with Thayer’s Nature’s Garden and Kallas’s Edible Wild Plants: Wild Foods from Dirt to Plate and you may end up with an intriguing new hobby. Addendum: when I wrote this post 6 years ago, I forgot to mention that the samaras are a great addition to spring salads, too. I had a little more to say about them this year, and you can read it here. 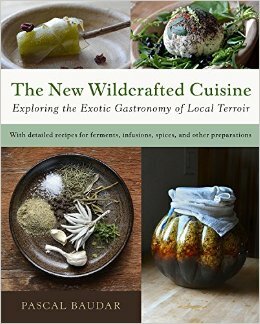 Periodically someone asks me what wild food books I recommend. There are a number of good ones, and a much larger number of bad ones. For overall high quality, level of detail, and knowledge of his subject, I’m a fan of Samuel Thayer and his books on foraging, The Forager’s Harvest and Nature’s Garden. Thayer has chosen to cover a smaller number of plants at a much higher level of detail than other guides, and if you’re a beginner I especially recommend this approach. There’s plenty of time to branch out later. I also recommend the delightful books of Euell Gibbons. They are not field guides and I don’t care for the recipes much, but his sheer joy in his subject is infectious. I became interested in wild foods when I was 12, and my wise mother bought me a set of Euell Gibbons books so that I wouldn’t poison myself. The gift has lasted almost 40 years (so far) and it would be impossible to calculate how much it deepened my love for the natural world. This is a good opportunity for me to talk about my own view of foraging and use of wild edibles. Too many people with too little knowledge are out there seeking wild foods (and, worse, teaching about wild foods.) Most of us didn’t learn from experienced parents and grandparents, so respect your own learning speed and style. Consult at least two guidebooks before you decide that you have identified a plant, and read the first 40 pages of Nature’s Garden before you do any actual foraging because the information about a safe approach and common pitfalls is invaluable and well written. Remember that you are introducing your body to entirely new foods, and eat very small portions the first time, followed by small portions the second time, to determine your tolerance. 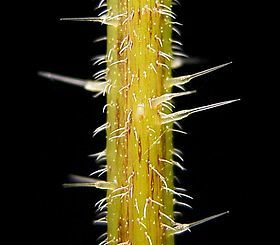 NEVER assume that one part of a plant is edible just because another part is edible. Many common vegetables have toxic parts- the ordinary potato has toxic foliage- so there’s no reason to assume that edible leaf equals edible fruit or root, or vice versa. 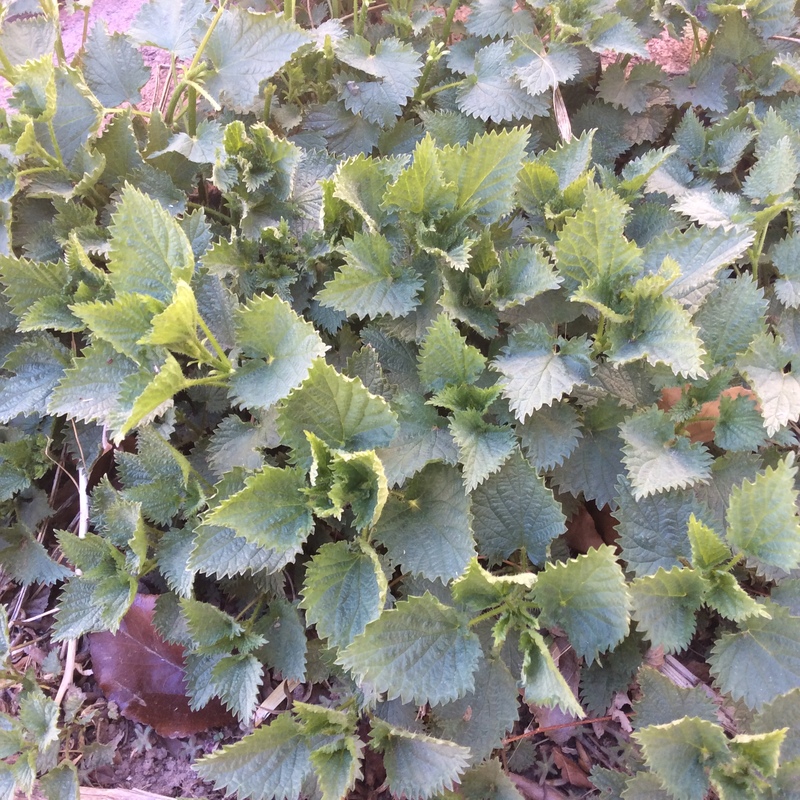 NEVER use this blog to identify a wild edible. I write about cooking and eating, not about plant identification, and the information that I give is not adequate to identify a wild plant when used alone, nor are my photographs taken with clear identification in mind. If you want online information, Thayer has an excellent website at Forager’s Harvest, and Langdon Cook has a delightful blog about wild food adventures in the Seattle area. Our climate in New Mexico is very different, but many of the plants he collects are found in our area. That said, I can’t think of any hobby that has given me more pleasure than foraging. Sometimes people ask me why I seek and eat wild foods, when I have a garden and can grow all the vegetables I want. Euell said it best: “Wild foods are my way of taking communion with nature, and with the Author of nature.” I can’t think of anything we all need more right now than a positive connection with nature that makes us love it and want to protect it.